WHOA!! This looks tough! When I am feeling better, I am doing this!!!! Def. gonna have to try this one out! THANK YOU for showing us your entire workout (fast motion). When a workout says 3 minutes, if I can’t make it through the entire time, I might think I’m doin it so wrong, I might as well give up. And I do. Thanks for showing me its OK not to be perfect! I just discovered your page…and already a BIG fan. WOW, I did this and am soaked. Treadmil? What treadmill, don’t need that when I got this. I looked through the rest of your workouts. Amazing! 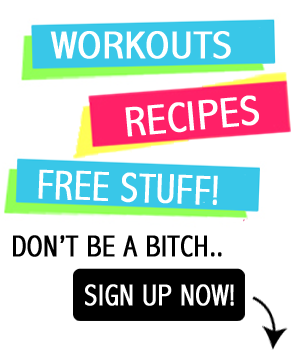 I can’t believe you give these workouts for free! Thanks so much! aw so glad to have you here April! I do what I can, I realize not everyone can afford a personal trainer and not everyone can even get to a gym. Hope to see you on the newsletter and facebook!